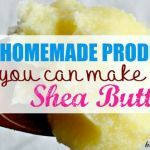 Homemade Shea Butter and Goat Milk Soap Recipe - beautymunsta - free natural beauty hacks and more! 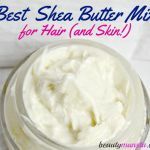 Enjoy this homemade shea butter and goat milk soap recipe for soft smooth and silky skin! 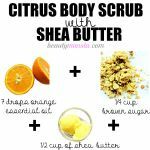 Ever since I was in my teens, I’ve always wanted to make my own homemade soap from scratch. 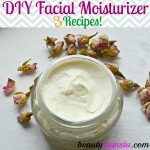 Being a natural DIY enthusiast, making homemade soap just had to be on my bucket list! And so I started this exciting soap making journey with shea butter and goat milk as the star ingredients! 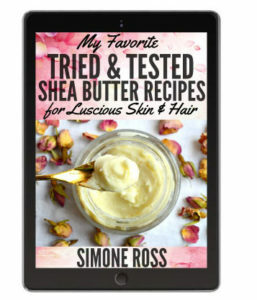 In my EBook, you’ll find my amazing & most loved shea butter hair milk recipe with goat milk as the main ingredient! Goat milk is super nutritious for the skin and hair and I just in LOVE with it. 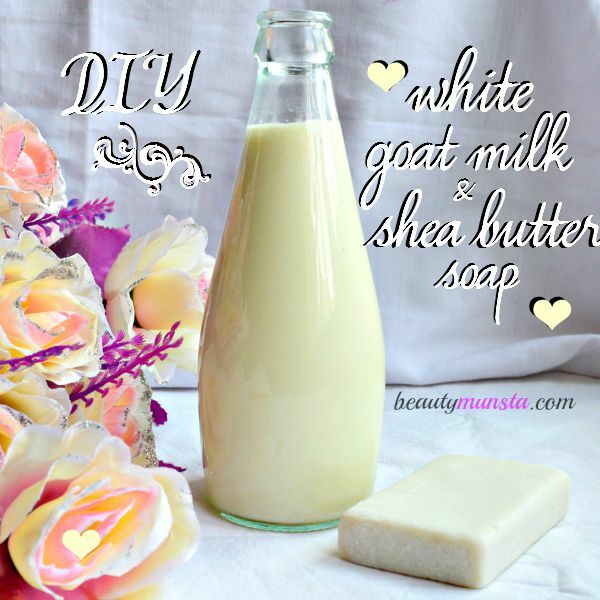 Okay, on to the shea butter and goat milk soap recipe! Freeze the goat milk beforehand, preferably the day before by fill some ice cube trays with goat milk and freezing overnight. Measure out the goat milk and place it in a container. Before you proceed, make sure the goat milk melts to a creamy form. Place the container into a larger container containing ice water. Measure out the lye. Pour out just a little of the lye into the goat milk and stir well. Measure the temperature of the milk. If it reads below 100 degrees, pour in a little more lye and stir well. Take the temperature again, and if it reads below 100 degrees, pour in a little more lye. If it’s above 100 degrees, stop and allow the mixture to cool. Continue like this until all the lye is mixed into the milk. Each time you mix in the lye, you will see the saponification reaction take place. Once all the lye is mixed in the milk, remove the container from the ice water bath and keep the ice water aside. You may need it if heat starts to build up, however, if you followed the instructions above carefully then you should not have any more heat building up. 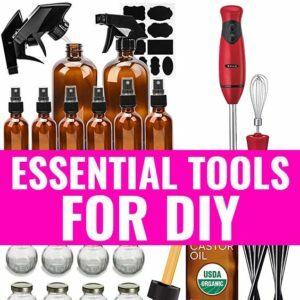 Measure out the oils and butters needed and melt them in a stainless steel soap pot over a low flame. Once melted, the oil/butter mixture must be around 80 to 90 F. You can keep it to cool over a cold water bath until you get the desired temperature. Your goat milk lye mixture should be around the same temperature (80 to 90 degree F). You can also cool it over a cold water bath. Carefully measure out the essential oil to be used and place it in a small bowl. Now all your mixtures are ready to be mixed up to make soap! Note: The lye goat milk mixture and the oils & butter mixture should be at the same temperature when mixing together. Slowly and gently pour the lye & goat milk mixture into the melted oils mixture and stir by hand first until everything is uniformly mixed, then use a stick blender for a more effective mix. Continue mixing until you reach ‘trace’. Test for trace by pouring/drizzling a little of the soap batter on top of the rest of the batter and if it sits for sometime then slowly sinks back in, you have successfully reached trace. Now that it has reached trace, it’s time to mix in the essential oils blend. After mixing it in, pour your soap mixture into the soap mold. If using a wooden one, immediately transfer it to the freezer to keep it cool and prevent heat from building up – this will also maintain the soap’s white color. Once it has solidified, get it out, cut it and place on a drying rack to cure for 4 to 6 weeks. Alternatively, you can just wrap it up in brown paper and store the soap in a clean dry place for 4 to 6 weeks before you can use. 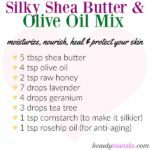 Time will fly and before you know it, it’ll be time to lather up using your own homemade shea butter and goat milk soap! It’s totally optional but if you want to get the very white colored soap as seen in the picture above, add ¼ tsp of titanium dioxide to the lye and mix well. Soap making is quite a delicate process and you should be very careful when handling the ingredients especially lye and other rare ingredients used in the recipe above. Please make sure to wear protective gear and be careful while making your homemade shea butter and goat milk soap! All the best!